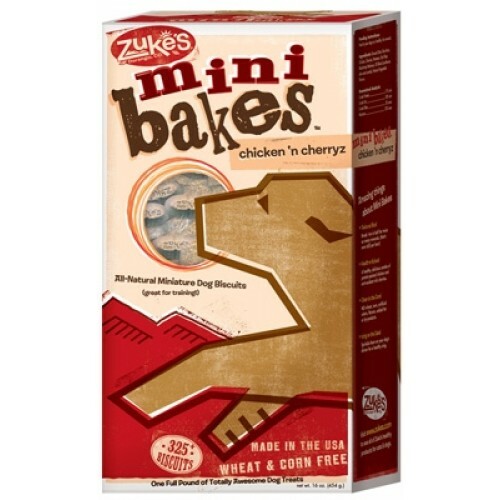 Mini Bakes™ are the cruncy, delicious, fun to feed miniature biscuit that are perfect for training and frequent feeding frenzies. Each health-a-licous flavor begins with ground oats—never wheat or corn—enhanced with a scrumptious protein source, plus a nutritious whole-food flavor addition like blueberries, potatoes or cherries. Over 325 treats per box! Stock your Pocket - Take Mini Bakes with you and don't worry about the greasy residue other treats can leave in your pocket or on your hands. Clean to the Core - No wheat, No corn, No artificial flavors, No by-products. All Natural - All Zuke's. Ingredients: Ground Oats, Rice Bran, Chicken, Cherries, Potatoes, Oat Fiber, Blackstrap Molasses, Oil Blend (sunflower, olive and canola), Natural Vegetable Flavors.